Li Na might look tough with that tattoo but it wasn't helping anyway. 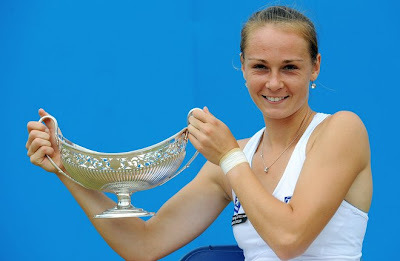 In fact she let Magdalena Rybarikova bageled her in the first set before going down 0-6, 6-7 (2-7) at the Aegon Classic. This is Rybarikova's first WTA Tour singles title. She earned a first prize of $37,000 and a trophy that almost look like an Aladdin lamp. To tell you the truth, I'm not really good in remembering women's players especially those with long names and fresh faces like Rybarikova. So I made an effort to look for her info and to my amazement I found some pretty memorable photoshoot of her.